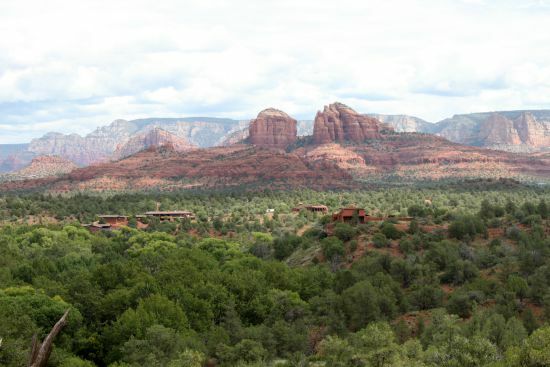 Red Rock State Park is a 286 acre nature preserve and education center located just outside Sedona, Arizona. I’m a sucker for anything red rock related so I’ve been wanting to check out this park for a while. We took the family and did a day trip up there for a little hiking. 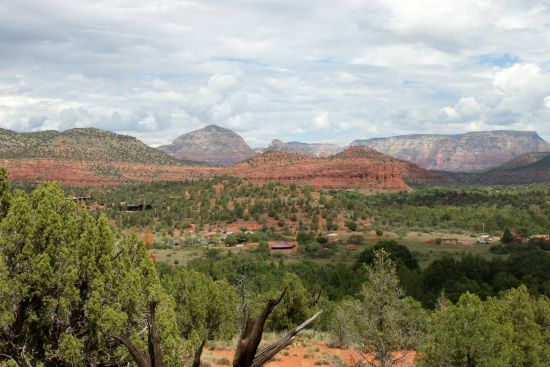 This park really lives up to its name – the scenery and views are stunning. I spent a lot of my time there admiring how beautiful it was. There are very nice restroom facilities with flush toilets and potable water. 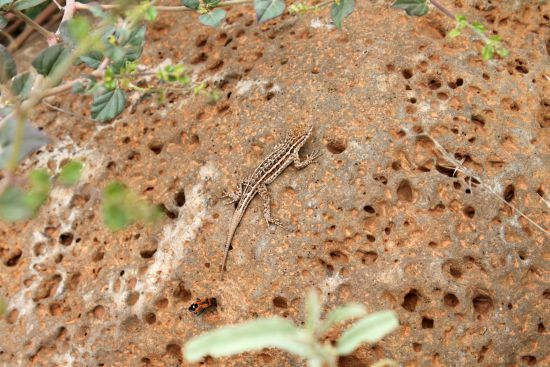 At 10am daily there is a guided nature hike that is provided as part of your entrance fee. We missed the guided hike, but intend to catch one the next time we go back. However, even if you miss the hike, I recommend touring the visitor center and adjoining education building (34.811412, -111.828621). Once you drive through the entry station (34.817945, -111.833074), you’ll get to the parking lot with ramadas for group events and picnic day use. Even the parking lot offers gorgeous views. We packed a picnic for after our hike and were glad we did because we got to stay and enjoy the scenery while we ate. 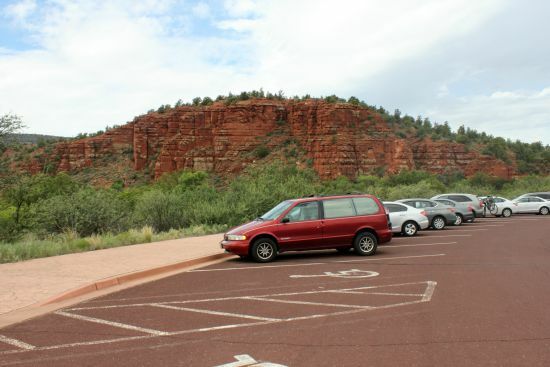 The visitor center can also be accessed via the main parking lot. It’s a bit unique in that you can actually go on top of the visitor center for scenic views and into the building (which is two levels) for more information about trails, the gift shop, and some really cool interactive exhibits featuring local wildlife. My kids really enjoyed the downstairs area of the visitor center with the hands-on exhibits. 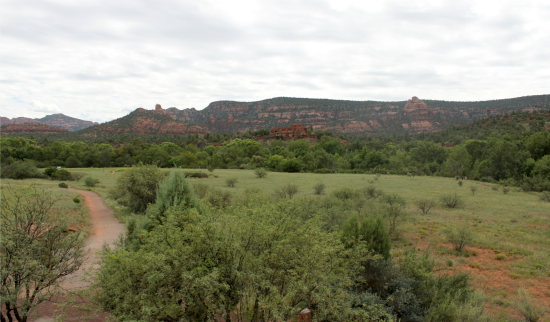 The view from the deck allows you to see the House of Apache Fire, the green meadows which lead to Oak Creek, and the red rocks rising in the distance. 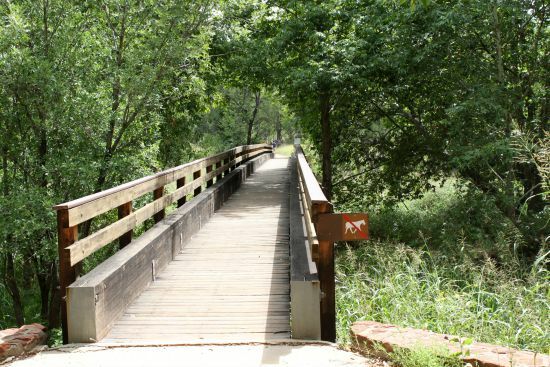 The park offers several different hiking trails. 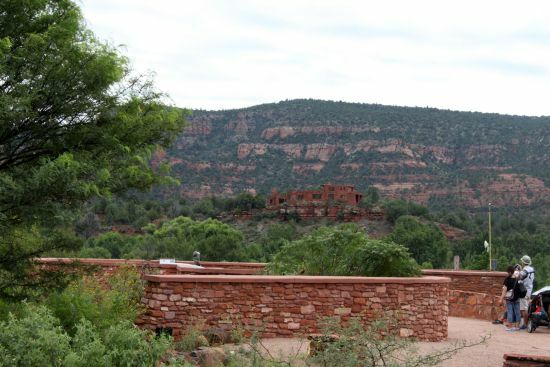 After consulting one of the park staff at the visitor center, we opted to try out the Apache Fire Trail because I was anxious to get as close to the house as possible for a better look. 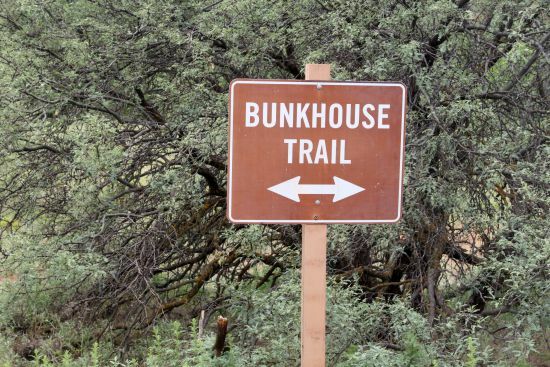 We started out on the Bunkhouse Trail (which is next to the visitor center) in order to connect up to the Apache Fire Trail. The Bunkhouse Trail begins by crossing a meadow. The terrain is mostly level so it’s a great trail for beginners or small kids. While you hike you can absorb those gorgeous views! 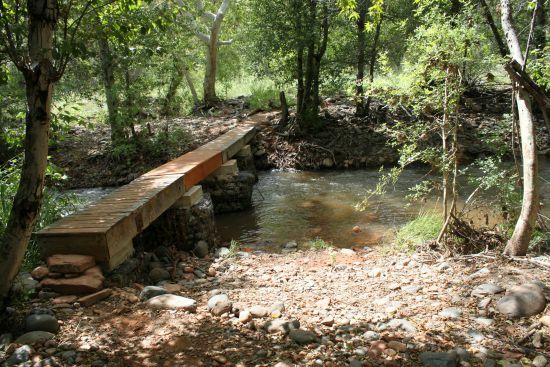 Next you’ll come to Kingfisher Bridge which will take you over Oak Creek. 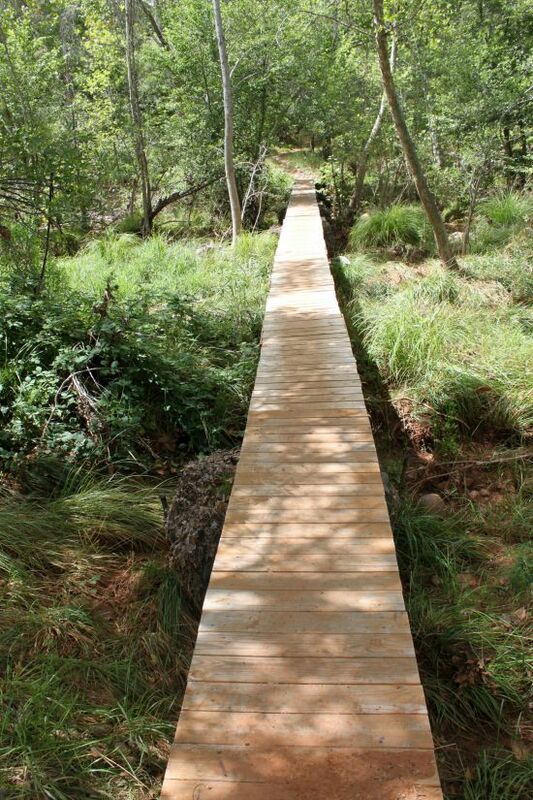 This is the view once you cross the bridge and are clear of the meadow area. Beautiful huh? 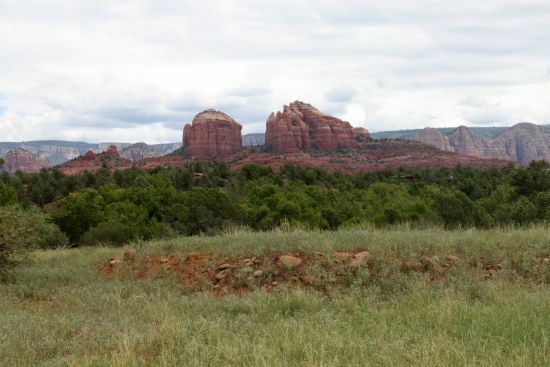 At this point the Bunkhouse Trail ends and the Apache Fire Trail begins. This trail leads you all the way around the House of Apache Fire. 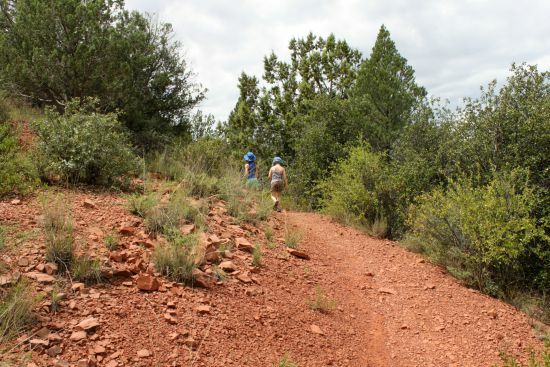 It’s a very easy trail with a gentle rise and flat walking surface. And only a short distance away is the House of Apache Fire (34.808520, -111.825370). The brief history of this amazing house (and the land it sits on) is that it was built as a vacation home by Jack and Helen Frye in 1947. 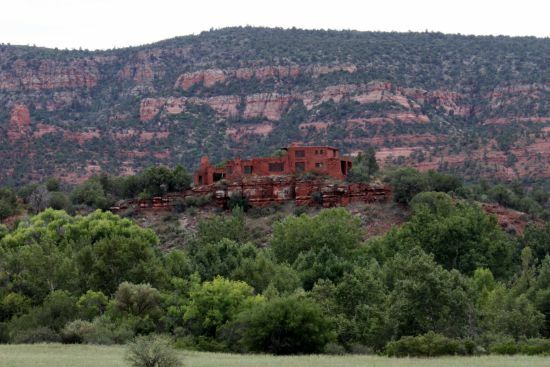 Jack, then president of TWA, and Helen began purchasing land in 1941 in order to create a vacation retreat (their 700 acre ranch was called Smoke Trail Ranch.) 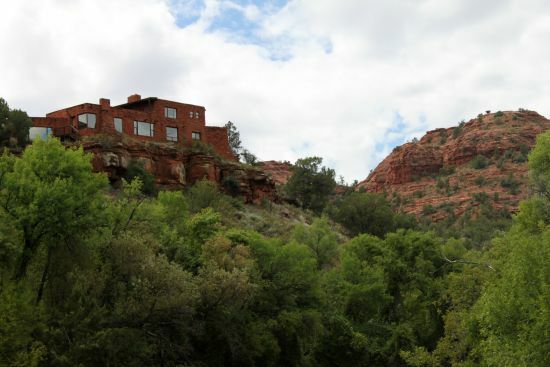 Construction on the house began in 1946 and much of the home was built by members of the Yavapai-Apache tribe who camped along Oak Creek during construction. The smoke from their fires was the inspiration for the name – House of Apache Fire. The couple later divorced and Helen retained ownership of the house and ranch. Over time, the ranch was divided up and in the 1970’s Helen sold the remaining 330+ acres to a developer. However, the developer was never able to fund the venture due to monetary problems. Then in 1976, a religious group called Eckanar was able to purchase the land with help from Helen with the promise of developing it into a spiritual retreat (Eckanar was an alternative religious group that she was associated with.) Helen died in 1979. 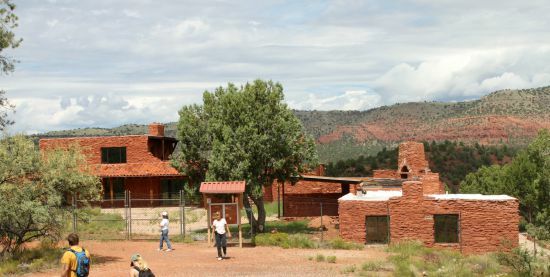 In 1980 and 1981, through a complicated series of land trades, the state of Arizona was able to secure part of the land that was formerly Smoke Trail Ranch (including the House of Apache Fire.) 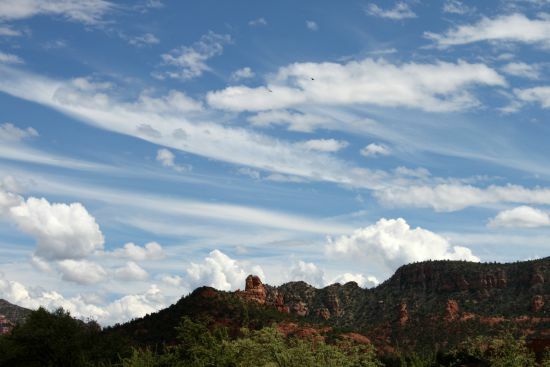 Red Rock State Park officially opened on October 19, 1991. 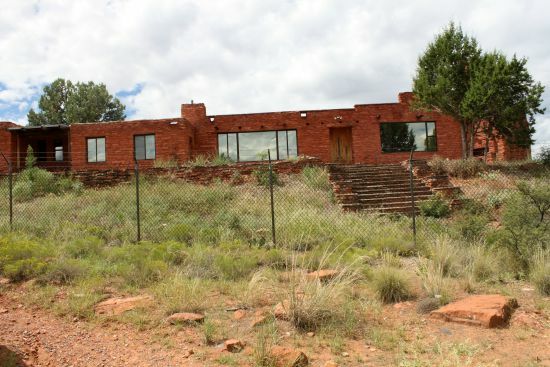 Unfortunately, the house is only available to be walked around – the entire home site is behind a chain link fence. There is hope that someday the house will be open to the public for viewing. While I would love to see the inside – even the outside was worth a look. We decided at that point that the trail wasn’t nearly long enough and opted to extend our hike a bit. We decided to hit the Coyote Ridge Trail. The great thing about the Coyote Ridge trail is that it offers several different viewpoint spots. Plus, because we were looking for a slightly more difficult hike – this trail was perfect for us. 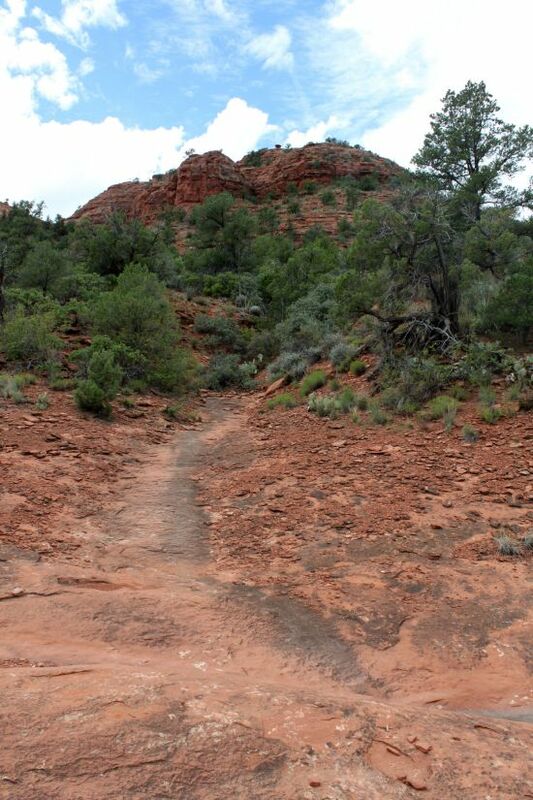 The Coyote Ridge Trail is a bit steeper and more windy and it takes you through several wash areas. 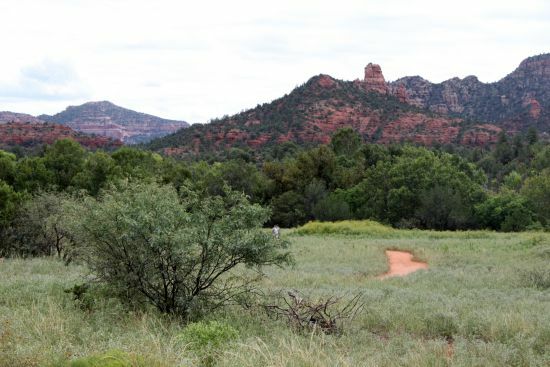 As we hiked this trail, we were glad we approached it from the Apache Fire Trail instead of the Kisva Trail or Eagles Nest Trail. The approach we took made for an easier downhill hike. Since it was midday at this point and we’d already been hiking for a while, the kids were wearing out. And when you’ve got tired kids – downhill is better than uphill. 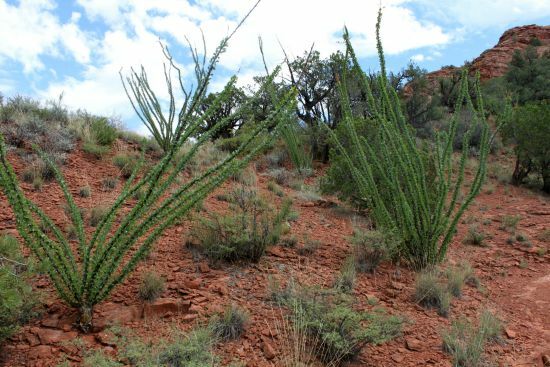 So if you’re looking for a more challenging hike – take the Kisva Trail/Eagles Nest Trail to the Coyote Ridge Trail instead of coming by way of the Bunkhouse Trail/Apache Fire Trail. And the ocotillos were green! Normally this time of year, they’re brown sticks with lots of thorns. 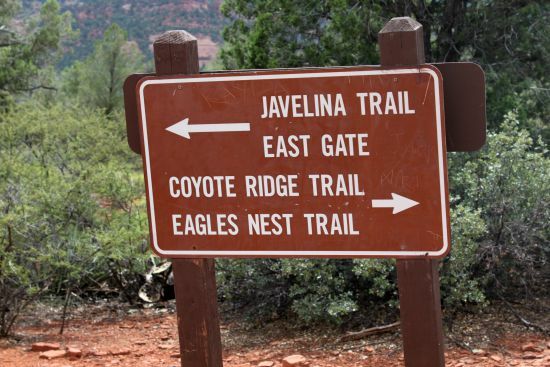 When we got to the junction between Kisva Trail and Eagles Nest Trail, we decided to try out Eagles Nest. Eagles Nest is a bit longer and more scenic than Kisva Trail. Even with tired kids, it was a great family-friendly hike. 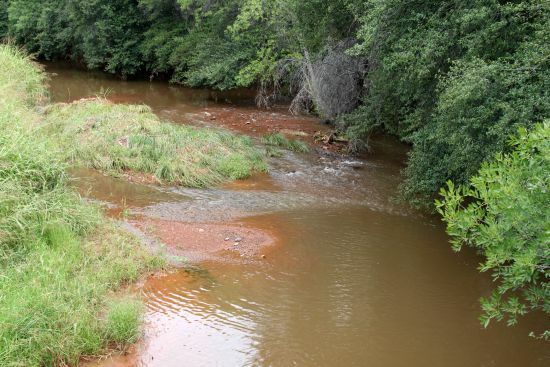 With either Kisva or Eagles Nest you eventually wind up down by Oak Creek. The shady banks of Oak Creek were looking pretty nice at this point because we were HOT. Here’s another small section of it. After we found our way to the parking lot again I was struck by how many birds we could see in the sky. I tried to take a picture, but they were so high, you can only glimpse the little black dots. Even so – how blue was that sky? 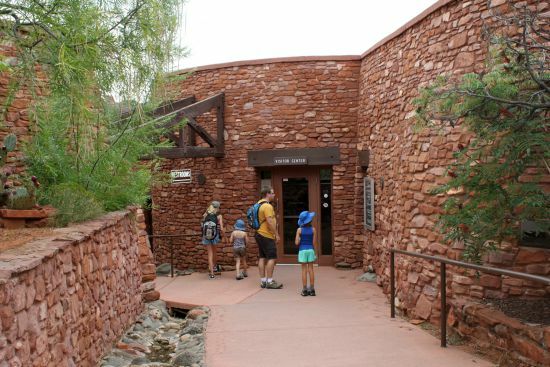 For more information or to plan your visit – check out the website at Red Rock State Park.